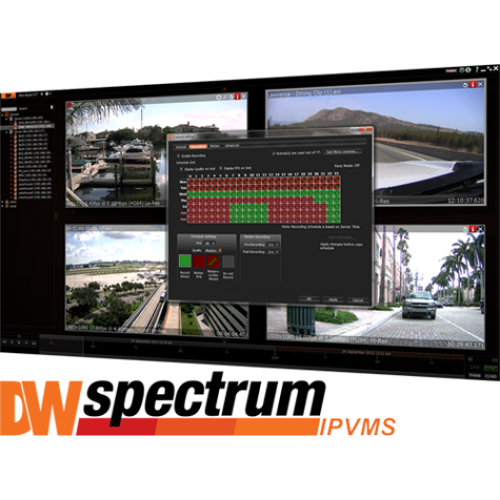 The DW Spectrum is powerful and user-friendly IP Video Management software, highly optimized to provide unlimited scalability, unmatched bandwidth savings and simplified system setup and management. DW Spectrum offers cutting-edge User Interface (UI) with features such as unlimited layout designs, smart network bandwidth auto-adjust; the software is fast, light and powerful. Use the login credentials to access one of our DW Spectrum demo sites, publically available to all our customers. 1. Go to the DW Spectrum product page and download the client software for free. 2. Once installation is complete, launch the DW Spectrum software. 3. Enter the login information from this page in the client's login window and press "Test" to test the connection, or "OK" to connect to the DW Spectrum demo site. 1. Click on the arrow next to the username "demo" on the left side of the screen. 2. Select any of the available demo layouts by clicking-and-dragging the layout name into the display area. You can also right-click on the layout name and select 'Open Layout in a New Tab'. 1. Go into the app store and search for 'DW Spectrum' to download and install the app on your smart phone or tablet for free. 2. Once the app is installed on your device, launch the DW Spectrum app. 3. Tap on the plus (+) symbol on the top of the app. The add site screen will appear. Enter the demo's login information and save the settings. 4. Tap on the demo name on the sites list and press the connect button. 5. Once the site displays the camera's thumbnail, tap on a camera to view in full screen mode.